A couple months ago, my daughter asked me to make her a bunny that would fit in the palm of her hands (check out the free Mini Bunny pattern). It wasn’t long before she started telling me she wanted a REALLY big bunny that she could hug. So here she is, Mrs. Huggy Bunny! She works up quick since she calls for Bernat Baby Blanket yarn. She did use a little more yarn than I had expected or wanted to use, but she was worth it! She measures 15 inches from the bottom of her feet to the top of her head. If I make another one, I will most likely add 1 or 2 more rows with the arms… but other than that, I wouldn’t change a thing. My daughter loves her! Small amount of medium/worsted weight yarn for the nose and mouth. Finish off leaving a long tail. Add the safety eyes and stitch on the nose and mouth with yarn and and a yarn needle. Stuff the neck and head. Weave the yarn tail back and forth through each stitch around. Pull tight to close the hole. Weave in your end. Finish off leaving long tail. Repeat for second ear. Fold the wider end of the ears in half and attach them. Finish off leaving long tail. Repeat for second arm. Finish off leaving long tail. Repeat for second leg. what size of balls, is the baby blanket yarn you used? Each one is 86 yards each. I knew as soon as I saw the picture of the Huggy Bunny it was the squishy Barnat baby blanket. I love it, thanks for the pattern. Now I need to go buy at least 2 more skeins so I can make 1. Did you use all three strands in each stitch? Or is was the color of your yarn the multicolor? I’m a bit confused as the stitches seem so close together. What size did you use for the safety eyes ? They are the bigger size of the two I have seen. I believe they are 1/2 inch. Is the head, neck and body all one piece? Thanks!! It’s so cute I am going to make one for each my Grandaughters! I love the idea to use this material for this! It’s perfect! How are the ears, arms and legs attached? Any special stitch? I have all the parts done and now need to attach them. These are absolutely adorable. I have made one and a friend asked for 4 for Easter. I am making one for each of my 5 little Grandkids for Easter. They are so cute. 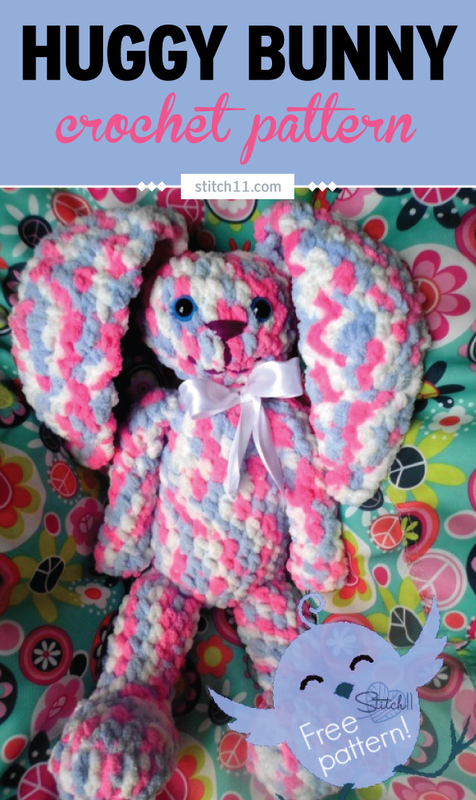 I am having a hard time understanding the directions for the ears with “folding the wide endwhen finished crocheting and attaching to the bunny. Do you stitch down both sides to close? At the bottom of the ear, I just folded the two corners together and attached it.. I just thought it gave it a nice bunny ear look. And made it look like there is an inner ear. But it is not required that you fold the bottom. You can keep it straight. For the arms Round 2-10 do you join to the first hdc after completing each round or no? I noticed you did on most of the others but didn’t know if you did for the arms or not, it wasn’t written to do so! Thank you for sharing this lovely pattern! No, I didn’t. You can if you want, I just found it easier not to. Thank you for the beautiful pattern. I used the dusty rose color & the bunny is so cute! It’s for my grown up daughter! I did add two rows to the arms, i increased the hdcs in the 2nd and 3rd rows to make ‘hands’ for the bunny. I will post pics on Ravelry. Thank you again. Did you make a tail for this bunny? If so, how please? Love this pattern…thank you. LOL! This will be the first doll that I will have made for my daughter. She just turned two so there must be a big pom pom tail! After posting I actually found one of your ravelry pattern users had posted a picture and reference to your pom pom tutorial. Check it out. Very cute. Maybe you should include your pom pom tutorial as an update option and link. Thank you again for this great pattern. I just wanted to thank you for the WONDERFUL Huggy Bunny pattern. I have made two from a post Moogly shared and since then Everyone wants one… I know it says you can sell things you make from your patterns but I would not know how much to sell it for … I know my cost after my 50% off coupons from joann fabrics but would I use the retail price then double that? It takes me about 2 evenings to complete… I was thinking about selling them for $30.00… What do you think? Is that too cheap…. I only do top quality work so they do look amazing. Thank you! And I think you are right about $30.. I wouldn’t sell it for less than that. Since they work up quickly… I don’t think you are undercharging unless you didn’t have the 50% off coupons. I haven’t sold any but I would personally go for anywhere between 30-40. Pricing for this would be $40.00 fairly. You would be making $25 on each not counting the labor. Thank you! I will give one a try and see how I do. Have a nice day! Thank you so much for this pattern. I had recently purchased some of Bernats baby blanket yarn, thinking it would be great for a blanket , but after working with it , I don’t like how it works up as a blanket,now I know what to do with it ! Thanks again. I would just use smaller yarn and a smaller hook instead of these really bulky baby blanket yarn. Thank you for this great pattern. I absolutely love the Huggy Bunny and have made a couple of them. I was wondering if there are any directions of how to turn this into a bear. My granddaughter loves her bunny but she also wants a bear. This the best pattern that I have come across in a long time. I made my first one as a gift and 15 Huggy Bunny later, I can make with my eyes closed. I used plain color the match the multi-color on the feet to make it look like shoes and it looks fantastic. I took your advice with making round ears for a bear and it looks like a koala bear because I used the hard nose like the eyes only it’s nose shape. I did start to sell them because everyone wanted one. I sell them for $25 if I get the yarn on sale and $30 if yarn not on sale and have not had any complaints about the price. It is soooooo soft. Thank you soooo much for this wonderful pattern. It’s one of my favorites. I want to send you my photos of finished products. Where can I send it to? I’m struggling with this same part…. Help anyone??? You just start with the CH. After you make the ears you will attach them. I just wanted to say a big thanks for this pattern! It is soooo adorable, I made it as part of a baby shower present (I also made a bobble blanket & tucked bunny under the blanket for presentation). The bunny was such a hit I’ve had other girls at work (nurses) asking do they have to get pregnant to qualify for a bunny! I will be making more…I love, love, love this bunny! Huge thanks again! Thank you for sharing this pattern. That you made it available as a pdf why that is simply icing on the cake. Excited to make it for my schnookums. Am almost finished with my first bunny and loving it! It works up quickly and the pattern was fairly easy to follow. I have several granddaughters that will love these treasures on Easter Sunday. Thanks for sharing your pattern with us. It was delight to put together! Hi Corina…. I love using Baby Bernat yarn and making this Bunny with it was so fun and easy!! Any chance you have made any other animals like this?? I’d gladly purchase any patterns you have. Thank you!! THANK YOU for the wonderful pattern! I have always wanted to make this and today I sat down and did it! SOOO love the bunny! Will definitely be making more! Thank you for this pattern. I wish you had more using the same yarn- I love using the Bernat baby blanket yarn. I have made 24 of these bunnies-for every child I know!! And a few adults! My husband says I have to STOP!! They are pretty easy for me ( an old novice at crochet). I really enjoyed making them, ans wish there were other projects like this one. Thanks again. It’s lovely! I am planning a baby shower for my daughter, I am not decided yet to make bears, bunnies or jirafes! How do you start the ears? I don’t understand how to skip one on the first chain. When you turn after making the chain, you will not crochet into the chain that is closest to the hook. You will skip that chain and continue to the next chain. Hi, I had a question about the ears. I just finished one and it is as long as the bunny is from head to bottom. Yours don’t seem that long in the picture. Any advice? Do you crochet tightly? My ears are really long. Where did you get the eyes for the bunny, and are they hard to put on? I bought these at Hobby Lobby. Most craft stores have them though. They are REALLY easy to put on. You just slide it into the stitch you want it, then snap on the back piece. Thanks so much for this pattern. I am making one for my friend’s baby who is turning one and now I think I am going to make one for my 1 1/2 year old son. I had some leftover plain yellow I used for the ears and feet and I am using a multicolor for the rest of the bunny, I think it will turn out pretty nice. I think for the next one I make, I am going to use the fuzzy bernat blanket yarn (I’m not sure what it is called), or maybe I will just use the fuzzy one for the ears 🙂 Thanks again for the pattern, it is so easy to follow.